It's Friday morning, the day after Thanksgiving. We've taken the Christmas tree out of the box, set it up, and will be decorating it soon. After the rosemary bush we used last year -- maybe 18 inches tall in a pot we draped in white gauze and decorated with miniature balls and bells -- this one seems quite big. (Last year we were in the midst of redecorating the living room and were waiting for our new carpet and furniture to arrive after Christmas. Our old couches had ben hauled off, and we had little enthusiasm for putting up a tree in the middle of our mess.) By day's end, it will look a lot like Christmas around here. I'm seldom on top of Christmas shopping, no matter my intentions, but it looks like things are coming together this year. Shopping is always a wonderful part of the Christmas season, but it can be pretty distracting. Wouldn't it be wonderful to have a distraction-free December! In just a couple of days November will be history. I am hoping for a December where the joy of Christmas and the reason for Christmas reign in our home. I know we can't determine our circumstances, and it may or may not turn out to be a peaceful December for any of us, but the peace of Christ can reign in our hearts. That's what I pray for each of you. There is a lot of talk right now about Thanksgivukkah, what with American Thanksgiving and Hanukkah falling on the same day. The last time this happened was 125 years ago, and it will be nearly 77,000 years until Hanukkah, based on the Jewish calendar and Thanksgiving, based on the Gregorian calendar, intersect again. Most of the talk I've heard centers around food -- sweet potato latkes, deep fried turkey, stuffing made with bagels and challah. After all, both holidays have their food traditions, many of which have overshadowed the reason for the holiday. But it's the reason for each of these celebrations that interests me. Hanukkah, the celebration of lights, is a commemoration of God providing for the Jewish people. When Syria outlawed Jewish rituals and ordered the Jews to worship Greek gods, the Jews revolted, and the Maccabees drove the Syrian army out of Jerusalem and reclaimed their temple. This was in 165 BC. They wanted to light an eternal flame in the temple, but had only enough oil for one night. The small amount of oil lasted for eight days, until more purified oil became available, and it is this miracle, and the rededication of their temple, that is celebrated at Hanukkah. The Pilgrims arrived in the New World in 1620. After difficult conditions, failing crops and sickness took the lives of many of their group, the following year their harvest was bountiful. With the help of the native Americans and the grace of God, they survived, and they celebrated the blessings they had received with a feast. We call it Thanksgiving. In Hanukkah and Thanksgiving we see two peoples, nearly 2000 years apart, receiving amazing provision from the Hand of God. Both groups were also in search of religious freedom, which came at a high price. Yet God preserved them both. As we celebrate tomorrow -- Hanukkah, Thanksgiving, or Thanksgivukkah -- let's not allow the wonderful food or the fellowship overshadow the truth that God is our provider and He is our Help. Let's thank Him from honest hearts for His mighty deeds. Twenty-four-years-old, healthy and full of energy, deeply in love with his new bride. Cameron Stevens went to the YMCA last Monday for a little basketball with a couple of co-workers. Ten minutes into the game, he collapsed onto the floor. As he lay there his body seized, then his heart stopped beating. Cameron is a youth pastor at Calvary Chapel of Everett. His senior pastor, Billy Wheeler, cradled his head in his lap during the seizure and, when Cameron's heart stopped, administered life saving measures until the medics arrived. They rushed him to Providence where he spent the week in a medically induced coma. At one point they brought him of it, but breathing on his own was more than his body could take, and, after one day, they had to induce a coma again and restore assisted breathing. All the while his family and close friends kept vigil by his bedside. My friend Lisa was there. It was her best friend's son-in-law in that bed, and Lisa stopped by every day after work to sit with them, and to pray. And Pastor Billy was there too. On Friday Lisa reported on Facebook, "Billy has been at Cameron's side since this incident occurred. His spiritual vigor has been simply amazing." "The message is that God uses tragedy in our lives to draw strength from Him," Pastor Billy told the Herald. It was the grace of God, expressed in Isaiah 41:10, that he and those praying with him clung to: So do not fear, for I am with you; do not be dismayed, for I am your God. I will strengthen you and help you; I will uphold you with my righteous right hand. Those who kept vigil sensed that God was going to do something amazing. There was among them a conviction that the Lord would bring Cameron through this, restoring him to life and to ministry. So they prayed, trusting in God to do His good work in Cameron. And on Saturday morning God answered the prayers of those in the hospital room and from all over the country who were praying for Cameron. Lisa posted on Facebook Pastor Billy's comment: CAMERON IS FULLY AWAKE AND SMILING A MILLION DOLLAR SMILE!!! On Friday it was determined that it was pneumonia that caused Cameron's sudden cardiac death. He had not felt ill, just a little fatigued and stuffy headed. He experienced no other symptoms that would suggest that a game of basketball would be fatal. Once they had a correct diagnosis they could begin proper medication. And God has raised him up! Let's pray for his complete recovery, so that he can continue ministering to young people. I hear he has a special knack relating to kids, particularly those whose lives are rough. Might his story of God's power and love touch the lives of many young people for years to come! Sometimes we have a pretty good idea where we are headed at any particular moment, but other times we feel like our path is leading into a jumble of overgrowth and we have little hope of finding our way. Today let me remind you that God knows the way, and He has promised to lead us. Our task is to trust; His is to lead. Peace to you today, and rest. Today's verse on my Ceaseless e-mail was 1 Chronicles 16:11, Seek the Lord and his strength; seek his presence continually! As I was praying that verse for the five friends whose names were included in the e-mail, I thought of Frances Thompson and his powerful poem called The Hound of Heaven. Thompson was born into a devout Catholic home in 1859. His father was a doctor in northern England. As a young boy, Frances studied to be a priest, but dropped out of seminary. He then spent six years studying to be a physician, but he never practiced medicine. What he really wanted to do was to write. But as a young man he became addicted to opium, and, poor and homeless, he attempted suicide. It was a prostitute, whose name he never revealed, who took him in and nursed him. In 1887 Thompson sent some poems to Wilfrid Meynell, editor of Merry England, a Catholic literary magazine. When Thompson saw one of his poems in print, he went to Meynell and introduced himself. The publisher saw Frances' broken state and learned his story. He and his wife took him into their home and through the rest of Thompson's life Mr Meynell looked after him. He also arranged times at monasteries for him to recuperate and write. It was during his first monastery visit that he wrote The Hound of Heaven. I was introduced to The Hound of Heaven through John Rupert, our pastor during my junior high years. He loved the poem and referred to it often. During college I pulled an all-nighter the day before my paper about Frances Thompson and his poem was due. I was charmed with the Victoria language but even more so with the images of an unseen follower, close on the heels of one who was determined not to be found. The illustrations in my copy of the poem, drawn by Jean Young, were mysterious, other-worldly. The Hound (God) who longed for relationship with Thompson -- with us -- would not give up the pursuit. In the end, we hear His words, "Ah, fondest, blindest, weakest, I am He whom thou seekest! Thou dravest* love from thee, who dravest Me." So this morning as I prayed for my Ceaseless friends and for people I know of who are running from God, I turned to the Hound of Heaven Himself, asking Him to soften their hearts so that they will realize that, indeed, He is the One they seek. Might they learn to seek the Lord and His strength; might they seek His face continually. I invite you to read The Hound of Heaven here, or to listen to Richard Burton read it aloud here. Has the Hound found you yet, or are you still fleeing? He is the One you are seeking. Isn't it time you let His love embrace you? You can find out more about The Hound of Heaven at these two websites (here and here) and by watching the video below. We'd been to a church potluck with our trusty rice cooker, the one we got for our wedding nearly 25 years ago. That pot has made a lot of rice in its day! I can't even remember what concoction it cooked that Sunday three weeks ago, but we brought home the nearly empty rice cooker, stored the leftovers, and washed the pot. It was hours later that we realized we had arrived home without the cord. I called Sam and Robin. Did you see an extra cord? Yes, it's on the counter at the church. OK, thanks. I'll go back this evening. But we were tired. Rather than return to the church that evening to claim the cord, I waited till Wednesday. But when I got to the church there was no cord on the counters or in the drawers. I checked the Lost and Found. No cord. Tom went later and hunted. He looked upstairs, downstairs, in the main building, wherever it could have been stowed. No cord. After three or four searches we gave up. There simply was no stray rice cooker cord at the church. It had mysteriously vanished. No problem, I said, I can find one at the thrift shop. But people don't turn in rice cooker cords to thrift stores. Telephone cords, computer cords, extension cords, more computer cords, more telephone cords...but not rice cooker cords. 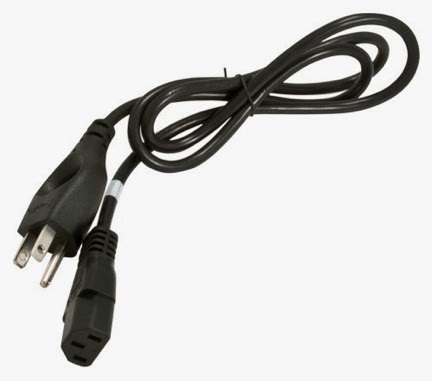 One day we will buy a new rice cooker, but right now a second hand cord is what fits our budget. Last evening we drove our son back to his house. We pulled up in front of the garage, our headlights shining onto a few odds and ends on a table in the attached carport. "Hey, look! A rice cooker!" Its cord was hanging down. I whipped out my phone and called our son's caregiver. "What about that rice cooker in your carport? We've lost our cord. Is that one available?" Ellen said the rice cooker didn't work, and the cord might be attached to the pot, but it was headed to the recycle, and we were welcome to the cord if indeed it wasn't attached. Voila! It detached and it fits. We'll be eating rice for dinner tonight! It made me think about my mom's friend Hank (I think her real name was Henrietta). 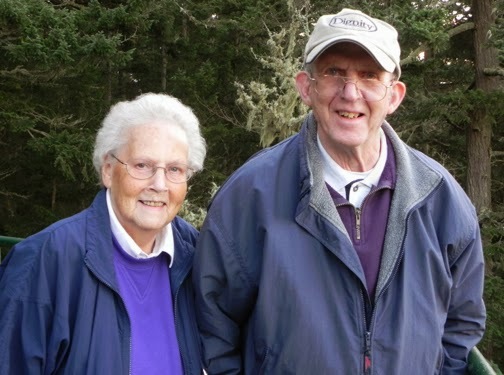 She and Mom were driving home from an outing one day and Hank was talking about her husband, Hugh. "He's always inviting people home for dinner, and I don't have much food on hand to serve them. And now he's invited some people for Sunday dinner and I don't have any potatoes for our meal." Hank had hardly gotten the words out of her mouth when she said, "Stop the car!" Mom stopped. "What's the matter?" she asked. "There's a bag of potatoes on the side of the road. I need them for Sunday dinner!" Keep your eyes open today. You never know where the Lord is going to hide a surprise for you! A little levity, a little philosophy for your Friday. It's mid-November and I am pouring over the new seed catalog, dreaming of the fruit that will come through all the wonderful seeds we plant this season. I see the vibrant colors, the high yield potential of these seeds, the food and livelihood these seeds will produce, and I'm excited to make my investment. Now, what shall I order...the satchel bag from India? the beads from Kenya? 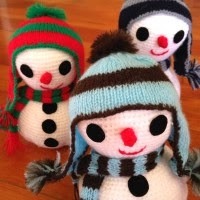 some Peruvian snowmen? maybe a cow for a Rwandan family? "What kind of a seed catalog is this?" you ask. It is the 2013 Christmas Gift Catalog of ICCM and SEED, providing 107 gift ideas with global impact. ICCM is the International Child Care Ministry of the Free Methodist Church. Through ICCM, over 21,000 children are being sponsored in 30 countries. SEED (Sustainable Empowerment through Economic Development) uses global partnerships "to create local livelihoods for people who may not have other opportunities in their local settings." It is also a program of the Free Methodist Church. Through the ICCM/SEED Christmas Catalog you can provide water filters to families, purchase a chicken or goat for a child, provide a scholarship for a college student, or sponsor one of 1000 children who are registered and just waiting for a sponsor. 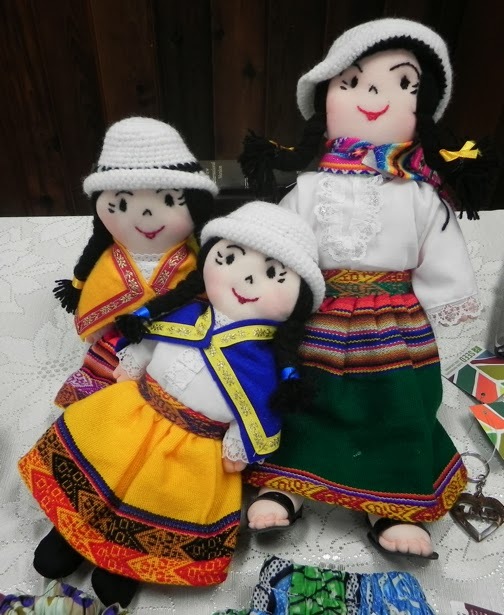 Or you can purchase products made by artisans in livelihood groups on three continents. Both ICCM and SEED bring hope and dignity to people around the world. In a couple of weeks a friend is hosting a Livelihood Trunk Show, where she will have available for sale what you see in these photos, as well as many other hand-made goods. She is passionate about supporting women in developing countries to empower them and use their creativity to provide for themselves and their families. - Grab a catalog and start shopping! Think about who you'd like to bless by ordering gifts through SEED and ICCM. 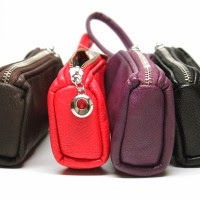 With each purchase you will be blessing the creator of the gift as well as the one who receives it. And you will be enriching the lives of people around the world. 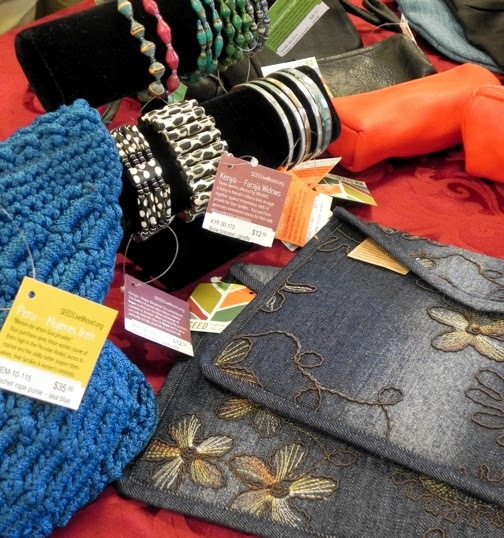 - Host a Livelihood Trunk Show! Give other people a chance to touch these gorgeous products, to hear the stories of the artisans, and to bless others. - Share this post or whatever links you want with your friends. Give them a chance to get involved too. - Sign up to sponsor a child or receive Tuesday's Child (ICCM's weekly e-mail) or join SEED's mailing list. - Pray. Pray for these ministries, for the lives impacted by them, for individuals you read about on the websites, for how the Lord would use you. The seeds we plant today through this catalog will bear fruit for years to come. So let's get busy and choose our seeds! 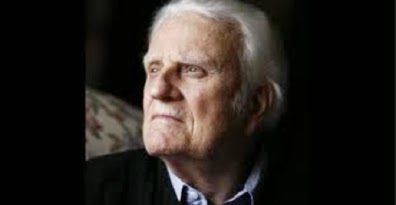 Who doesn't love Billy Graham, the 95-year-old who has spent most of his life in ministry? His hair is snowy white now, his voice deep and a bit gravelly. He sits more than he stands, and he's been alone for over six years since Ruth, his dear wife of 64 years, preceded him to Heaven. But he still has a passion for seeing men and women, children and youth come to know Jesus. We recently watched a 2-part video, (Part 1 and Part 2), produced by RBC Ministries, entitled The Calling of Billy Graham. Hosted by Wintley Phipps, who not only weaves a rich and compelling story but adds his musical mastery to the presentation as well, the program was filmed in Billy's native North Carolina, in Florida where he attended Bible school, and at the Billy Graham Evangelistic Association (BGEA) headquarters and Billy's home in Montreat, NC. Like Jacob of the Old Testament, Billy Graham struggled with God and, when he fully yielded, he never looked back. These videos show us how God prepared him for his long life of ministry that has impacted the world. It was September 25, 1949, when the Greater Los Angeles Billy Graham Crusade was launched, Billy was 30. Over the eight weeks of the crusade, 350,000 people came to hear him preach. His earnest message, bathed in prayer, always ended with a call for people to invite Christ into their lives, and this has been the hallmark of his speaking. Over the 65 years of Billy Graham's preaching, he has spoken to over 215 million people in 185 countries and territories. According to BGEA hundreds of millions more have been reached through television, video, film, and webcasts. Over the years, Mr Graham has held fast to the truth of salvation found in Christ alone. Yet he has not been afraid to be innovative in getting that message out. I remember in my youth watching nearly every movie that came out from World Wide Pictures, who produce and distribute BGEA films. They confront social issues as well as spiritual ones through their film ministry, a principle Billy Graham also incorporates in all his messages. It's not only Billy Graham's innovation and willingness to confront social and spiritual issues that God has honored these past 65 year; it is also his integrity and dependence upon prayer that God has blessed. He has lived a righteous life, and God has used him in ways he could never have dreamed. In The Cross, his team has taken great advantage of technology and creativity, using clips of past crusade messages, testimonies of celebrities who follow Jesus, and powerful visuals throughout the 29-minute video. 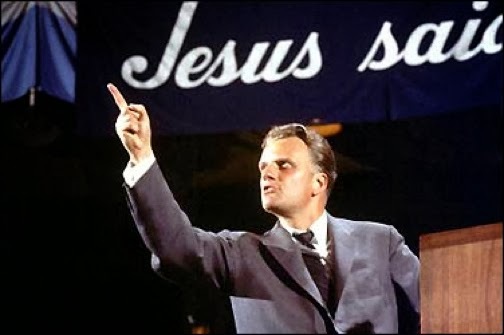 In this, his last major public address, Billy Graham reminds us once again that Jesus is the way to God the Father, and His love and mercy are available to all who will turn to Him. It is his simple, unchanging message, and it will still be true long after Billy Graham is gone. My friend Colleen posted this story on Facebook recently. It's a reminder of how we should live in our broken world. Used by permission. This morning, on my way to work, I was behind an SUV that was traveling at erratic speeds and slowing way down to sometimes 15-20 miles below the speed limit. Since we were on a 2-lane highway in morning rush hour, this was causing quite a backup behind us. I checked in front of the SUV and found there was a huge gap between him and the truck in front of him so I waited for my chance to pass him. When that time came, I signaled and started the pass. As I approached him, he sped up and kept speeding to keep me from passing him, but when I slowed down to try to get back behind him, he slowed down as well and wouldn't let me back into the lane. By this time, a car was coming head-on toward me. I looked over at the SUV driver, trying to get him to let me move somewhere and he was laughing at me as though he was actually hoping to cause me to hit head-on with the oncoming traffic. I made a split-second decision to cause an accident with him instead so I lurched my car in front of him in such a way that he would have been forced to broadside the passenger side of my vehicle. When he saw that, he backed right off. But once we were back into the swing of traffic, he rode my vehicle's rear bumper as close as he could, obviously trying to intimidate me further. To be honest, I was stunned by this driver's behavior and obvious enjoyment of putting me in such danger, and his clear delight in seeing the fear on my face. The sheer evil of that moment and that person was overwhelming. I can tell you that my thoughts of that person were anything but kind and compassionate. I found myself fantasizing about having supernatural powers (like Samantha Stevens on Bewitched) where I could wiggle my nose and cause all four of his tires to blow out and then his brakes to seize up and his engine to explode. When I got to work, it took several hours for my heart to dislodge itself from my throat and my heart rate to return to normal. I sat down and thanked God for saving me from that man and the accident he wanted to cause for me. I asked God to forgive me the all-out hatred I had in my heart for that man I'd never met -- and, yes, I hated that man with everything in me, much to my surprise. And I asked God what it was he wanted me to learn from that experience, besides the obvious, that the world is full of jerks. Immediately Matthew 24:12-13 came to mind: Jesus is talking in this passage about what the signs will be of the "End of the Age" (or the end times.). Because of the increase of wickedness, the love of most will grow cold, but he who stands firm to the end will be saved. I guess, what I fear more than mean, evil people who delight in my destruction, is becoming one of those believers whose love will grow cold. Today was a good reminder of how easy it can be to become one of those (and how justified I might feel in being one of those). Don't let me become of of those. 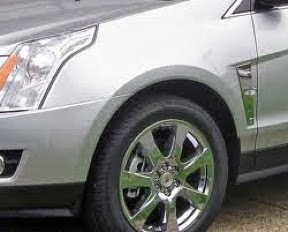 A world without loving believers would be a world full of people like today's SUV driver. And that, my friend, is Hell. When we pray the Lord's Prayer, we are asking God to forgive us our debts, just as we forgive our debtors. What, really, does this mean? A debtor is someone who is in debt. So "my debtors" would be those who are in debt to me. If I forgive them, I am canceling their debts. I am saying they no longer owe me anything. If theirs is a material debt -- say they owe me money or have destroyed something of mine and have not replaced it -- and I forgive that debt, they are off the hook. They do not need to repay me, and do not need to live in fear that I may one day bring this matter up to them again. It is forgiven. If theirs is an intangible debt -- perhaps they have offended me, have caused me pain, maybe slandered me, anything that has racked up a "bill" toward me that I can hold against them -- and I forgive them, the act that has indebted them to me no longer stands between us. They are free of the chains that I have bound them in because I have forgiven them. The offenders may not even know I have considered them my debtor. They may be chained in my mind simply because they didn't live up to my unspoken expectations, or I let a misunderstanding grow into a problem between us. I may have imprisoned an individual or even a whole race or a class of people, just because -- well, for whatever reason. I am the jailer, and I hold the key. God, in His mercy, has forgiven me a debt I could never pay, and He calls me to forgive others (Colossians 3:13). When, as a conscious act of my will, I forgive the real and the imagined debts against me, I am being faithful to God. And not only are others set free, so am I. This is the spirit in which the Lord wants us to live. As we forgive our debtors, we demonstrate our desire to live in "true love to all." What happens when I don't freely forgive? In teaching about the Lord's Prayer, one preacher says it this way: "If we forgive others only a little and hold grudges, we are asking God to forgive us only a little and bear a grudge against us." We are preventing God from showing us full forgiveness! Father, help us forgive our debtors. Last week the newspaper reminded us that there is still time to go for a drive before winter-like weather comes, so we made a plan with Dad and Mom to drive up State Route 20 toward the North Cascades Highway. But the paper didn't know that the snow line would be low on Sunday, so we headed west on SR 20 instead, to one of our favorite places -- Mt Erie. 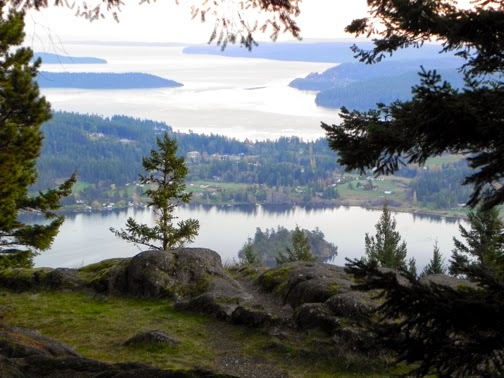 Standing 1273 feet, Mt Erie is the highest point on Fidalgo Island, the land mass that connects Whidbey Island to the mainland, just west of downtown Anacortes. You can see Mt Erie as you drive north and west from Mt Vernon, one of several huge rock outcroppings that rise up from sea-level terrain. 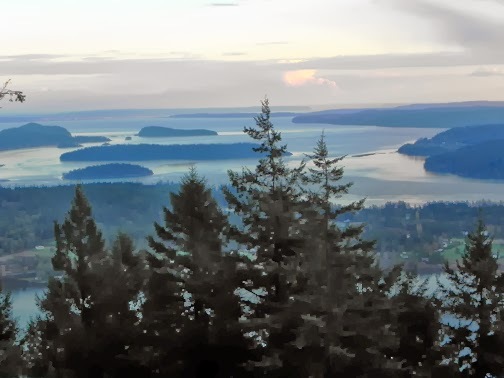 It is about half the height of Mt Constitution on Orcas Island in the San Juan Islands, and from both mountains you have a spectacular view. The advantage of Mt Erie, however, is that you can drive from your home to the top of the mountain without having to wait for (or pay for) a ferry to get you there. We arrived there about 4:30 in the afternoon and found that it wouldn't be too long until sunset. (We had just moved the clocks back the night before as we switched to Standard Time, so it got dark an hour earlier than we were used to.) We drove to the summit on the one-lane paved road, but many people come to Mt Erie for hiking or rock climbing. 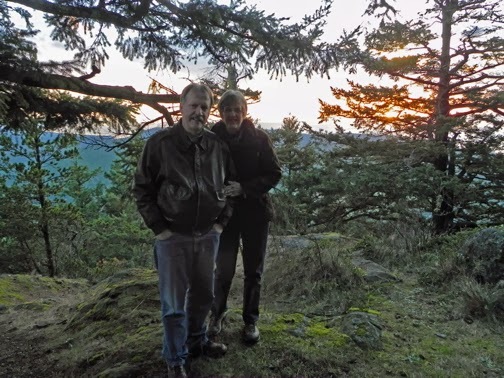 The light was dim on our drive up, as it is a highly forested road, but by the time we reached the summit and walked out to the points beyond the trees, there was plenty of sunlight. On a clear day you can see Mt Baker, 43 miles to the north, and maybe even catch a glimpse of Mt Rainier, 112 miles to the south. We enjoyed the views of the San Juan Islands, Lake Campbell just below the mountain, and westerly views toward the Olympic Mountains. Mt Erie is open year-round. 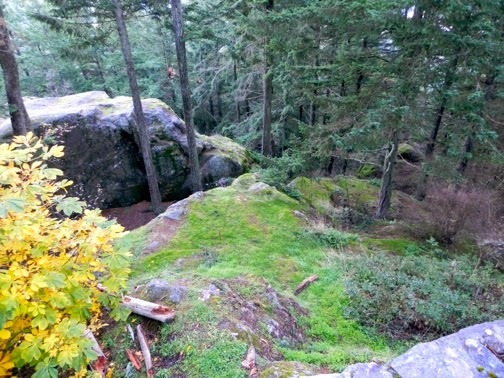 It's just 20 minutes west of Mt Vernon and eight miles from Deception Pass. If you find yourself with an unplanned afternoon, why not go see it for yourself? You can Google Mt Erie to find reports of others who have visited, and enjoy a time-lapse of the sunset from Mt Erie here. Let these great songs bless your soul today. No need to be downcast -- Jesus has set us free! So throw your head back and SING! Praise him! praise him! eve in joyful song. Heavenly portals, loud with hosannas ring! Crown him, crown him! Prophet, and Priest, and King!